Membean is used in more than 25,000 classrooms all over the world – we're trusted by teachers in every state in the U.S. and some of the best international schools. As an early adopter of Membean, I prefer to let my students speak for themselves, so I made this video showcasing how they feel about learning vocabulary. If I had the time to create it, I would make this. It enables me to do the analysis and things I like to do as a teacher… It fluidly fits into things I already do. It is the vocabulary discussion the program generates. Whether in conversation, their writing or otherwise — students recognize, recall and use the words they learn in Membean. About 80% of the kids rated it as much better than any previous vocabulary program, and they also noticed Membean words in their readings. Give it a try. Once you introduce it to your kids, you’re not going to want to go back. It’s a phenomenal addition to the classroom. 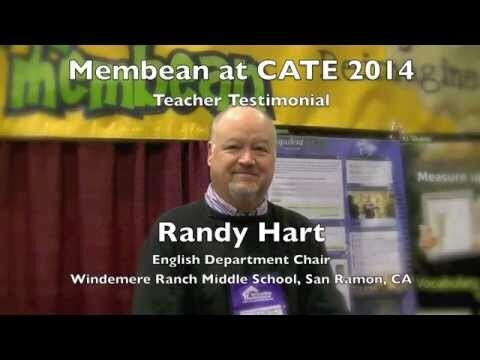 We're honored to have received such high praise from teachers using Membean in their schools. First I should mention that I sold my vocabulary books on Amazon. I never plan to teach vocabulary in class again! So of course you have the savings of vocabulary textbooks, but you also get the savings of the time you would spend in class on vocabulary, and the time you personally would spend on designing lessons, grading homework, and grading quizzes. We implemented Membean in grades 8-12, and we have many students tell us after the SAT that they 1) recognized many Membean words on the exam, and 2) felt that their verbal score was higher, thanks to Membean. Membean is a far superior alternative to the traditional ways of teaching vocabulary. In a normal semester, using the old way of quizzing on 10 or so words a week, a student would “learn” 180 words maximum. These might be words they already know, or they might be words beyond the student’s current vocabulary. Furthermore, they might cram those words in right before the quiz and not retain them for use even a week or two later. After a semester with Membean, my students have seen, on average, more than 360 words, words that are differentiated to suit their level. Plus, the repeated quizzing of those words means they are actually learning them for the long term. My evidence? They’re using Membean words in their essays without prompting by me. They’ll even use them in class discussion, elevating the level of discourse. And it’s easy to monitor from a teacher’s perspective—much easier than the old system. I've been meaning to write to you about your terrific program. This is my 46th year of teaching – and in that time I’ve even taught year-long vocabulary courses that were really fun. But I have NEVER seen the excitement for words that your Membean produces. What’s even better? The students are using the words in their essays – and they REMEMBER the words. Your program is truly awesome. Thank you so much. You are doing wonders for education! I have a student who a few years ago experienced a TBI (traumatic brain injury) and has subsequently lost about 50% of his short term memory. He typically scored in the 10-20% on all of his vocabulary tests he's taken from me this year. The information just did not exist past the few days he would study. Membean has changed all of this. Literally a miracle for him. With Membean, he is now testing in the high 80% to 90%. Everyone is amazed by this! The way the software works to wire those connections in his mind is astounding. Before he studied for 2-3 hours a week for 10 words and their definitions. With Membean, he is actually studying less in terms of time, but it so much more efficient his gains in retention so far...its just amazing. My students and I really enjoy working with the Membean vocabulary program. I find it to be an interesting program that helps students learn words they have yet to encounter, and it's fun! The following are quotes from my gifted students about Membean: "It's amazing!" "It's the best on-line thing I have done this year!" "It's better than the ___" "It doesn't feel like I'm learning, it feels like you're playing. My daughter,who is in my class,was making her lunch the other morning and said " Hey mom, I figured out how to keep my sandwich from getting soggy by putting the bread in one Baggie and meat in the other. " So, I said," Well now aren't you the sagacious one" she said, " I am just a virtuoso at making sandwiches!" It was awesome! We had just learned those words from membean! Told the whole class and trying to use those "million dollar words" in everyday speaking! My son has some learning disabilities particularly as it relates to language processing. Your program has been simply amazing for him. He is learning now like I have never seen him learn before. I wish you guys would create other subjects to teach in this manner. If you know of other resources that teach in this manner please refer me to them. In the meantime, you have literally changed my sons outlook on learning. There's a lot of enthusiasm about it. It really meets so many of our students' needs and is a perfect fit for a one-to- one school. I have been impressed with the overall learning experience for me and the kids, and think the benefits have been noticeable. I would HIGHLY recommend this program to anyone, and greatly appreciate the opportunity to have tried Membean with my students this spring. I see that kids can actually use the word in writing. During our class writings, I'll sometimes put a requirement to use a certain number of membean words, and I'd say about 80% are used correctly which is much better than traditional vocabulary practice. The English teachers at BK have been very pleased with the membean program. Kids find it different and fun. In fact, I had one student, while waiting in an airport for a speech/debate tournament, get on his phone and log in over 200 minutes. I, and the rest of the department, would like to commend Membean staff for their customer service. I have always received prompt e-mails and things are fixed within a very reasonable amount of time. Thanks for the wonderful program you and your team have produced! I've been teaching for over 30 years, and I've never heard such positive feedback from students as the feedback we're getting about Membean. Just sensational! We just started this week and my seniors are loving the program; they wish they had known about it to use to prep for the SAT! My kids still love it ..I am pretty particular about how I teach vocabulary and I am thoroughly impressed with this site. Kudos to your team. In general, the feedback from students and their parents is very positive. One of our intrepid student reporters did an article on Membean for the school newspaper. Most impressively I see students using Membean words in their work. They also 'get it' if they encounter a new word in their reading that contains the roots they have been studying. I love Membean!! I never thought vocab could be...FUN!! Thank you so much for helping me find passion for building my vocabulary. I've enjoyed it so much that I shared some podcasts with my mom (English is her second language) and she fell in love too!! Her face lit up when I played the first podcast for her - she couldn't get enough after that!! Thank you, thank you, thank you!! From my perspective as the building gifted/talented consultant, I really like how Membean is individualized to the student, quizzing them when they first set it up, this allows the student to avoid repetition of vocabulary they already know. My students absolutely love membean. We work 10 minutes a day, but many practice on their own. I asked my students if they prefer vocab books or membean and they unanimously said membean. Thank you!